pique a boo: I'M GOING TO BE AN AUNT! 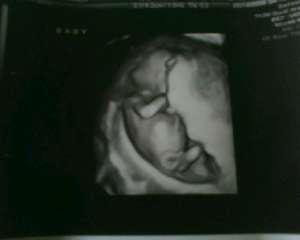 Attached you should find the first picture of Peanut, my niece / nephew. My oldest little brother is going to be a dad, making me an aunt. The mother is hs girlfriend of the last year. I don't know her name, I don't know if she did this on purpose. I don't know if they're going to get married - although I'm pushing against that until we know more. I do know Peanut will be hatched. And I will be an aunt. And we're going to see where this takes us. Also... this gets my parents off my back, which is a plus.